Of all the current buzzwords and hot topics in digital media currently, the “Attribution” discussion is certainly one of the most important, and it is constantly evolving. With the near-daily changes in available techniques and best practices, we thought it would be helpful to introduce the topic, discuss attribution as a priority to your 2017 marketing plans, and look at various available options when it comes time to take the plunge. At its most basic level, marketing attribution is described as “the process of identifying a set of user actions (“events” or "touchpoints") that contribute in some manner to a desired outcome, and then assigning a value to each of these events.” Essentially: which media channel helped me win my new customer? This sort of action was not necessarily possible with traditional media channels, but with the advent of digital media, tracking and assigning value between platforms has become more measurable and accurate – and increasingly a headache! But wait, shouldn’t all this new technology be making our jobs easier? Why do we spend so much time on this challenge? Let’s start back at the beginning to see where this world got so complex. In the beginning, search marketers had it relatively easy! I search for “New Jeans,” a Nordstrom ad pops up, I click on that ad and then purchase a new pair. My cookie can be followed from the search, to the click, to the Nordstrom website (with a tracking URL) and my purchase is recorded. Nothing to it! Sure this system would ignore me racing out to my nearest Nordstrom in person, pulling up the website on a separate browser or device, and certain other situations, but this system worked for a long time because it was simple, direct, easily tracked, and reliable to search marketers. This method is referred to as “last click” attribution (we explore the models in part 2), and is still in use with search marketers today. In a last click environment, none of these methods might count if I don’t engage with the ad. Even in a last touch method (explored later, but would count ads just served to me), the retargeting ad would get credit regardless of what caused me to first take interest in the jeans. And finally, without an ad server or attribution vendor, each of these partners might think they drove the sale! In response, ad servers and attribution vendors have risen to the challenge to provide services aimed at measuring this complex digital journey and accurately assigning value. There is a difference here between a servers and attribution vendors that should be addressed at this point. Ad servers exist primarily to help advertisers by facilitating the programmatic ad serving process (obviously! ), counting and selecting ads, and monitoring the progress of campaigns among different vendors. Ad serving partners provide a range of capabilities, but primarily have more basic capabilities when it comes to attribution relative to more complex attribution-specific partners. Attribution vendors, in contrast, focus specifically on the complex intricacies of multi-partner attribution, and typically offer more robust (and expensive!) solutions. This may include offline solutions, which can help brick and mortar businesses advertising online as well as marketers mixing both digital and traditional media. Attribution vendors are also typically a "next step" for marketers who outgrow the ad server attribution models. Before diving into the available models and methods, it is important to determine if your marketing team needs to explore an ad server or attribution vendor. So what are those questions you should be asking? 1. 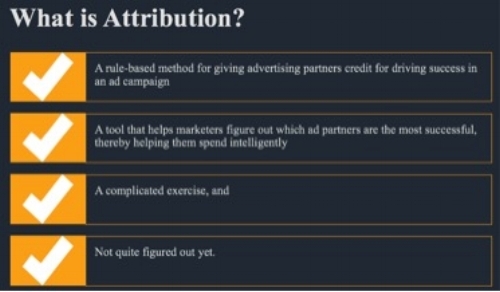 What are you getting from a focus on attribution? Whether you rely on a channel partner for performance metrics, have a simple A/B test setup, employ an ad server to help manage performance, or are using a more robust attribution-specific vendor, the end result is to accurately allocate the value and performance you are seeing from each partner individually and your media mix as a whole. That may mean a relative CPA value among partners, a measure of individual display performance (A/B test), or something more complex such as prospecting efficiency. Regardless of your approach and chosen metric(s), marketers use attribution results to judge relative performance, efficiently allocate channel budgets, and better understand overall marketing effectiveness. 2. How many channels are you working with? If the answer is 1 or 2, your needs might be minimal. Often, individual partners can help provide metrics to augment their reporting, such as an A/B test, to help prove their effectiveness. There is no magic number to require an attribution approach, but typically your needs increase as you add on channels. 3. Are you a performance advertiser interested in measuring relative performance? Because accurate and robust attribution systems can require hard work, constant attention, and cash(! ), the ROI on this decision should be high. If this information will be used to shift budgets between partners and justify marketing spend to the finance department, it may be worth a closer look. If current digital goals are more simple (such as CTR) or just nice to have at this point, it may not be the right time to invest! Again there is no set guideline or scorecard to determine what your needs are. In part 2, we will explore the available options and methodologies to help with that discussion!